DANBY - The early spring snow is still more than two feet deep outside, but under the plastic roof of Annette Smith's simple greenhouse, the lime trees bear a profusion of green fruit. >From some of the trees - which are grown in pots and which Smith keeps trimmed to about four feet - hang big, bumpy-skinned ponderosa lemons. "It's a cross with a grapefruit," Smith says, adding that it tastes more like a lemon. "It makes a fantastic lemon meringue pie." Other trees are laden with Bearss and key limes, dozens of them obscured in the lush green foliage. 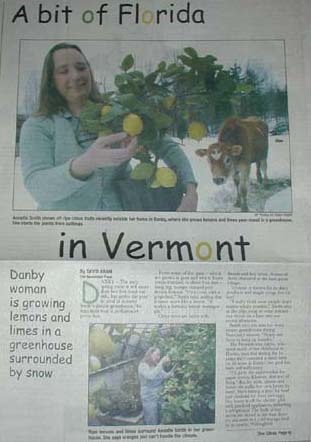 Vermont is known for its dairy products and maple syrup, but citrus? "I really think most people don't realize what's possible," Smith says as she clips away at some extraneous shoots on a lime tree one recent afternoon. Smith says she sees too many empty greenhouses during Vermont's winters. "People use them to hang up laundry." The Pennsylvania native, who spent much of her childhood in Florida, says that during the 14 years she's operated a small farm on 52 acres in Danby, her goal has been self-sufficiency. "I'll go to the supermarket for paper towels, Kleenex, that sort of thing." But for milk, cheese and butter she milks her own Jersey by hand. She's raising a steer for beef and chickens for meat and eggs. Her home is off the electric grid, with gas-fired appliances, including a refrigerator. The bulk of her meats are stored in the four drawers she rents at a cold-storage facility in nearby Wallingford. Two factors drove Smith to try growing citrus in such a cold climate. There was always citrus around as she was growing up in Sarasota, and she got into the habit of thinking "that's the way it should be." In addition, there was her desire to rely as little as possible on supermarkets for the food that sustains her. Smith puts it simply: "You need vitamin C."
One of Smith's citrus staples is rich, pulpy and delicious lime juice with the rind ground in, sweetened with sap from her maple trees. Phil Petty, chairman of the landscape development and horticulture program at Vermont Technical College, said he had heard of people growing some types of citrus as house plants. "But in terms of somebody having a greenhouse full of citrus so they can get vitamin C? Nope, never heard of it, not in Vermont." With Smith's greenhouse, the bottom two or three feet of the outside walls is underground, providing natural insulation. There's a low, open doorway leading into the cellar of the house, and inside there's one concession to convenience: A propane heater kept at its lowest setting replaced the wood stove with which she heated the greenhouse until a few years ago. Even with that bit of heat, it can get down into the 20s in the greenhouse on the coldest nights of winter, cold enough to freeze the water she gives to the chickens that sleep in a pen in one corner. Not all varieties of citrus can be grown in Vermont, Smith says. She's yet to find an orange tree that will work, so she sticks to the heartier varieties of lemons, limes, tangerines, various crossbreeds and the occasional kumquat. "Oranges just need too much heat and too much moisture," she says. Smith, 44, has a route on which she delivers the fresh eggs from her chickens, but she says she doesn't expect to make any money for her citrus-growing efforts anytime soon. "I've always had a fantasy of a greenhouse where I would sell the trees. I'd call it the Lemon Garden," she says. In real life, she supported herself for years by making copper lawn furniture and various sizes of something called a purse-box, a small cedar valise with compartments for change and other personal items that is meant to be carried like a pocketbook. More recently, she's been a full-time-and-then-some "citizen advocate." She first launched a so-far successful fight against two proposed power plants and an associated natural gas pipeline that was to cross her property. The effort spawned the group Vermonters For a Clean Environment. As that group's executive director, Smith has participated in several debates on statewide energy issues. On the local level she has spearheaded opposition to OMYA Corp.'s plan to mine the hill across the valley from her house for marble to be ground into calcium carbonate, a component of the paper-making process. Smith says she now does fund-raising to "raise my own salary." She adds that if there were someone else stepping forward to take up these battles, she'd gladly scale back her own activism. "I want to get my life back," she says. While her citrus trees winter in the greenhouse, she moves them outside after the danger of frost is gone in late May. Already there are tomato and other summer vegetable seedlings vying for space in the greenhouse. She'll plant sweet red peppers and harvest them right into November, well past the outdoor season for most vegetables in Vermont. Come September, the citrus trees will be moved back inside. "You really don't want them to get frosted outdoors," she says. Other than that, the citrus trees are "extremely low-maintenance," she says. Aside from the occasional pruning to keep them from outgrowing the greenhouse, Smith checks the leaves for scale - black sticky dots that need to be rubbed off so they don't spread and become an infestation. Smith says she doesn't mind the work on the trees. "They're nurturing me as much as I'm nurturing them when I'm out here spending time with them."